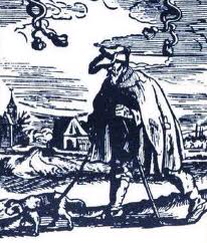 Graphic: Black and white artist's sketch of a little dog on a leash leading an older looking man wearing a cape, carrying a walking stick. Finding your blog is so strangely fortuitous. I am a high school librarian and I am taking Google’s searching class. They have us doing an activity where we use the left-side of the search where they have different types of media, like blogs. I put in my search term of guide dogs because I am a puppy raiser in Florida with Southeastern Guide dogs. We are getting ready to turn in our third puppy and get our fourth in August. I saw your blog and thought I have I have to read that! 😎 I’ll be on the lookout for your book. Not up on Amazon.com yet.